Most major chains are excluded. 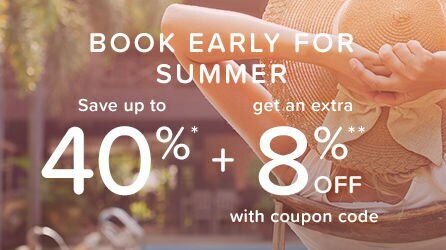 Offer valid for 8% off your booking when you stay between 1 and 28 nights. Book between 12:01am MT on April 16, 2019 and 11:59pm MT on April 22, 2019.Travel by September 3, 2019. You can’t collect or redeem Hotels.com® Rewards nights when you use this coupon. See full Terms & Conditions. Hotels.com is a leading online accommodation site. We’re passionate about travel. Every day, we inspire and reach millions of travelers across 90 local websites in 41 languages. So when it comes to booking the perfect hotel, vacation rental, resort, apartment, guest house, or tree house, we’ve got you covered. With hundreds of thousands of properties in over 200 countries and territories, we provide incomparable choice with a Price Guarantee. Our site is fun and simple to use, and we offer innovative online tools and a top-rated mobile app.